"Aunt Lucie." The fabric in the piece is very old, mid-late 1800's, scraps from a quilt. The book page is also old, but not as old as the fabric. 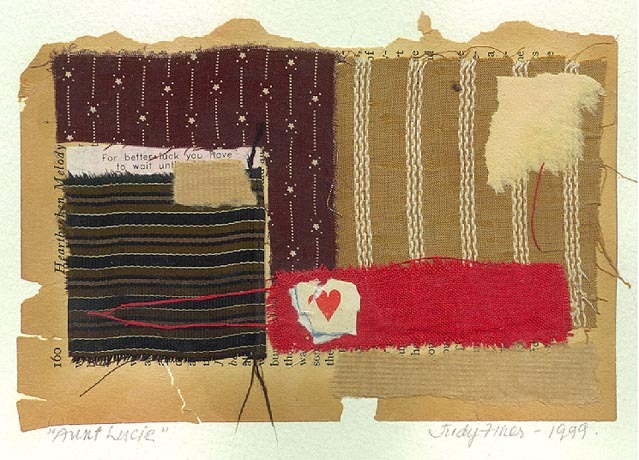 In similar work I have here, I've just straight-pinned the fabric onto pages (arranged not unlike the piece you have) - I like the implication of the possibility of change and alteration both in form and feelings. Judy Finer lives and works in San Francisco, USA.